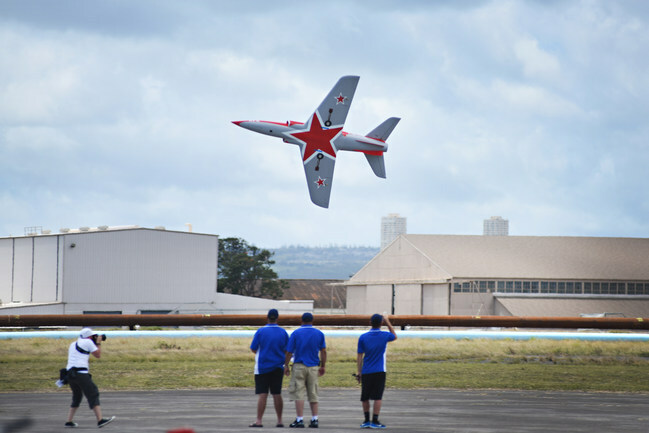 Approximately 12,000 people made their way onto historic Ford Island to attend this year’s Biggest Little Airshow in Hawaii at Pacific Aviation Museum Pearl Harbor. Now in its tenth year, the popular two-day remote control Airshow concluded today. More than a dozen top remote control pilots showcased their award winning Giant Scale aircraft. In recognition of the 75th anniversary of the Battle of Midway, pilots from nationally acclaimed Warbirds West performed an epic Battle of Midway reenactment with dive bombers and fighter planes, as well as a reenactment of the Pearl Harbor attack utilizing a fleet of Japanese AM6 Zeros. Aircraft stunts, helicopter aerobatics and flying formations kept the crowd on their feet. Just a few of the planes that flew at Biggest Little Airshow in Hawaii. Hundreds also made their way through historic Hangar 79 for tours of World War II restored aircraft and to climb into open cockpits. The event also included a Kids Zone with rides and kid-friendly activities, as well as a “Snow Field.” The two-day event capped off with a Jelly Belly “Candy Bombing” over historic Ford Island runway. Biggest Little Airshow in Hawaii sponsors included: Dr. Lawrence Tseu, Papa John’s Pizza, City and County of Honolulu, Joan Bellinger, Sheraton Waikiki, JN Automotive Group, 51 Fifty, Enterprise Rent a Car, Military Home Source, Jelly Belly Candy Company, MillerCoors, Xtreme Fun, iHeart Media, Hawaii News Now, Bank of Hawaii, Hele Gas, Pepsi, Pacific Air Cargo, Flight Journal, Model Airplane News, Airworld, King Tech Turbines, and Consolidated Transport, 76, Omni Air International, Vacations Hawaii, and Yelp. Pacific Aviation Museum Pearl Harbor is located on Historic Ford Island where bombs fell during the attack on Pearl Harbor, December 7, 1941. Located at 319 Lexington Boulevard, Historic Ford Island, Honolulu, Hawaii it is a 501(c)(3) non-profit organization that depends on membership, volunteers, and donations for support. To join, volunteer or support, visit www.PacificAviationMuseum.org.